Chinese rule of law is so weak that some local governments and even Communist Party organizations are awash with criminal syndicates. Lin Weixiong heads the police force of Guangdong, a province located in southern China with a population of about 100 million. On April 14, speaking at a news conference hosted by the provincial Public Security Bureau, Lin warned about the presence of gang activity in government. “[Criminal] activities have expanded to include economic crimes and included infiltration of the government, especially at the village-level. The infiltration of the government by gangsters have eroded the basic law at these areas, jeopardizing the foundations of governance,” Lin said. There is some ironic historical precedent. Before taking power in 1949, Chinese Communist forces colluded with local bandits and triad societies to develop their control over the war-torn countryside. Now, the criminal activity that once contributed to the Communist Party’s triumph over the Nationalist government over 60 years ago seems to be undermining the modern Chinese regime. Last June, the state-run Peoples’ Net reported Guangdong police arrested Feng Mouzhen, chief of Zhuyi village, along with 73 other people. Feng had abused his position to collect protection fees, run gambling dens, and amass wealth through construction projects. He also used violence to coerce or deter competitors and unruly locals. Before becoming village head, Feng Mouzhen had served a prison term that ended in 2007. As soon as he was released, Feng organized a crime syndicate in Baiyun County, located near Guangzhou, provincial capital of Guangdong. Four years later, with the help of his gang members, Feng successfully ran for and became the chief of Zhuyi village. A similar case reported by People’s Net occurred in Guangdong’s Shihu village, where a Communist Party secretary turned out to be the head of a local mafia. Communist Party member Wu Guicun was Shihu’s village-level party secretary and a representative to the People’s Congress in the nearby city of Jieyang, to which Shihu belongs. Wu had formed a gang with 11 others to engage in various illicit businesses and activities, such as illegal mining operations. Wu also made land-grabs, a common phenomenon throughout rural China. In January 2013, Wu summoned over 100 goons to attack and beat villagers who gathered to oppose an unlawful construction project to be carried out on 66 acres of their land. In July 2014, Wu Guicun was sentenced to 25 years in prison and his personal assets were confiscated by the state. That May, another Communist party secretary—Huang Minchang of Anfu village—was arrested by Guangdong public security. Huang, like Wu, had also run a gang involved in embezzlement, extortion, intimidation, and beatings, according to Chinese newspaper Nanfang Daily. The convergence of gang and government in rural China is not limited to Guangdong Province or the Chinese south. In February 2014, Xinhua reported that the Party secretary of Qilizhuang village in Hebei, Liu Huimin, had appropriated 70 million yuan (about $11 million) to carry out illegal construction projects and hired thugs to oppress peasants who resisted this use of their land. Liu was sentenced to death in August 2013. Duan Yanli is the former director of Hebei’s Nanshangen village committee. He also made a fortune running a local mafia that prostituted women and ran casinos, according to Sina, a Chinese news service. In July 2007, Duan was sentenced to 20 years in prison and fined 4 million yuan (about $645,000). 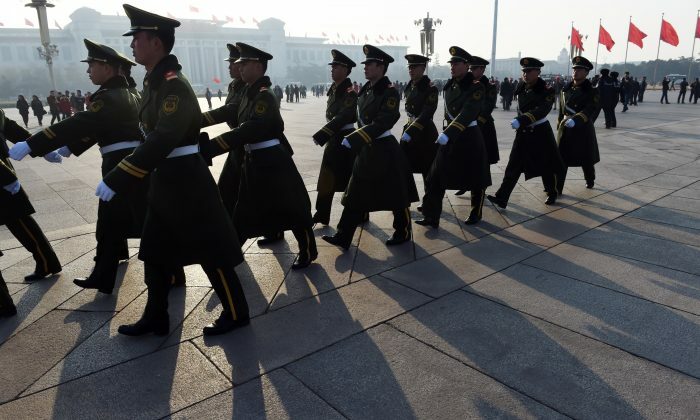 During an anti-terrorism drill last month, Chinese police used petitioners as targets.